I recently bought a new BTO flat and these days, the blocks are built pretty close and parallel to each other. My neighbour's altar which is in his living room faces directly to my master bedroom. I was told to buy a mirror to 'reflect' it but I'm not sure exactly what this entails. Hope to seek your advice and thank you in advance. 1. As you mentioned, it depends on the proximity of their altar. Close proximity is subjective. To some, it is close-by. To others, may be a comfortable distance even if "close-by". 2. Compass directions: the worst is IF your master bedroom and the altar at a NE (devil's gate) and SW (devil's backdoor alignment). If so, a bagua mirror with a convex mirror at the centre is okay to be hung above the bedroom window. 3. Type of GOD. Although many conservative FSMs (Feng Shui Masters) will always ask to place a ba gua mirror, even for all types of GODs. 4. In essence, majority of FSMs would often ask you to purchase a traditional Ba Gua Trigram at the outer ring and the convex mirror to deflect it. 5. Liberal FSMs may ask you to draw the day curtain permanently. A typical Ba Gua mirror to "deflect" a altar facing one's main door or windows: has both the 8 trigrams at it's outer perimeter + a mirror at it's centre. Traditionally, the mirror is flat. The rational is that a spirit usually is scared to see it's own image. Nowadays, the most popular sold is a variant of B. Modern. But the mirror is often conVEX or conCAVE. Even though there is also a flat mirror. Should I choose a Ba Gua mirror with a flat or conVEX mirror. In the past, it was a flat mirror. For the purpose of someone looking at it, will look at it's exact face. Just avoid buying a ba gua with a conCAVE mirror for this purpose of "defending" against an "altar placement". Case Study - Is the altar really facing the master bedroom windows? 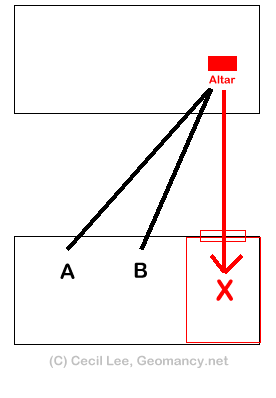 Please note that only if the altar directly faces your master bedroom window as shown as marking in red "X"; then this is considered the altar facing your master bedroom. But on many occasions some think that even if the altar faces markings A and B; this is also like what you meant. If so this is not a concern, here. Thus what you mentioned is not a "threat". Thank you so much for your very comprehensive information. Yes, the altar is actually placed at position X as you have drawn which was why my wife and I were concerned. For the placement, the altar is actually exactly to the North while my bedroom is exactly at the South side. I would say that the distance btw us would be roughly 35 metres. Then following traditional practises, for peace-of-mind the ba gua mirror can be valid in this case given your above clarifications.